You are here: Home / Hot Topics / This is why we volunteer. This is why we volunteer. On September 13, 2014, Thirty two dedicated SCCE compliance professionals gathered in an underground bunker to begin their battle against homelessness among veterans of the United States. At 11 hundred hours they boarded transport to Hope Manner One (HP1) where the struggle was to begin. Marine Captain Lucas Waldron, manager of HP1, issued orders and offered vital intelligence. 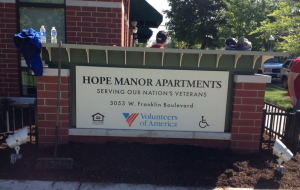 Hope Manor One is a two year old facility funded by the Veterans Administration and the Chicago Housing Authority (CHA). 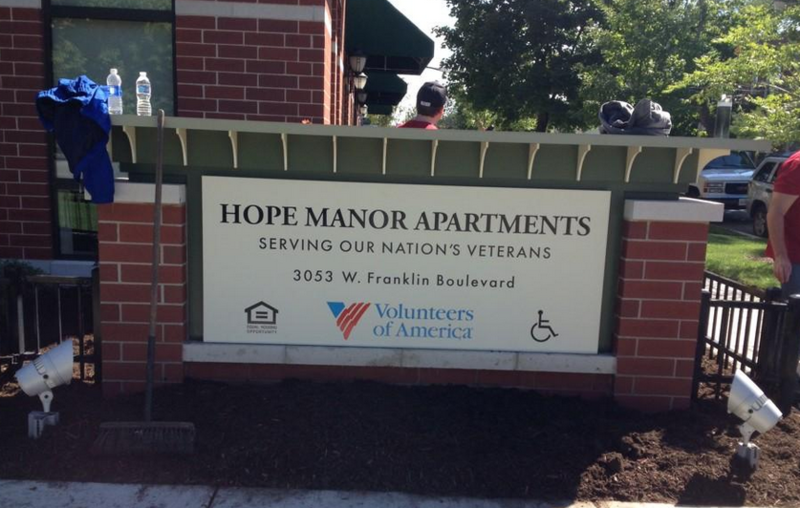 HP1 provides housing for 80 homeless veterans and assists with nutrition, medical, mental health, job placement and other support services for veterans in need. Veterans can be referred by the VA or other local agencies or can apply for assistance directly. The only requirement is that they have served in the military. The first mission was to maintain the landscaping around the perimeter of the building and to literally weed out the enemy. Compliance officers crawled on their knees to find and eliminate weeds, one by one depositing their lifeless remains into plastic bags, it was ugly. “I love the smell of herbicide in the morning” was heard as veterans began to spray the ground to keep the enemy away for good. Then wheel barrels and shovels began to move out and spread the mountain of mulch onto the beds where the weeds had previously occupied, and new shrubs were planted. We all smelled like manure but it felt good. Another patrol was deployed inside the building to maintain doors in the common areas. Tape was applied to window frames, and battleship grey paint was applied liberally. When we were done the mess area and latrine doors looked ship shape. Our final mission was to clean the windows on the first floor. crews were dispatched with buckets, sponges and squeegees to clean the more than 20 glass surfaces with soapy water. Dirt from the street was scraped from the windows one by one until the job was done. At the end of the 3 hour mission we had completed 90 percent of all the objectives, leaving only a small pile of mulch remaining to be deployed. We posed for memorial photos and received a hearty thank you from the Capitan Lucas. On the truck back to the barracks the mood was silent, shoulders and backs were sore. But no compliance professional should forget the battle of Hope Manor One.